“We believe that each person, including those with disabilities, have a God-given right to be heard; recognised and appreciated as people of inherent worth; and respected for the potential they carry.” This is the philosophy behind the work of Christian Outreach to the Handicapped (COH). COH is an interdenominational organisation that provides day activities to adults with intellectual disabilities whose IQ is less than 70. Their ages range from 16 to 55, and they come from all races, religions and financial backgrounds. These beneficiaries also have accompanying conditions such as Down Syndrome, cerebral palsy, Autism Spectrum Disorders (ASD), speech impairment, hearing impairment and epileptic fits. The COH ministry was started by an American Baptist missionary, the Rev Alice Shae, in 1979. In line with our philosophy, we value every client in COH as an individual who bears God’s image, with God-given potential. COH focuses on clients’ physical, mental and spiritual well-being, providing holistic care and showering them with God’s love. By engaging our clients actively in our day activities, we aim to build acceptance of and offer hope to them. Our day activity centres plan different programmes for the clients, guiding them in community living skills and activities of daily living. These programmes aid the clients in integrating and contributing back to the society. We aim to tap on the skills and talents of the clients and harness their potential. Our centres do not only support the clients in their development. We also hope to manage and correct any challenging behaviours. We hope to be able to inculcate and instil in them confidence and the necessary skills to lead lives as normally as possible. With clients actively involved in our centre’s activities, respite is provided for their caregivers, allowing caregivers to get the rest they need. By guiding the clients to gain independence, we hope to alleviate the stress of their caregivers as well. Our work in reaching out to these beneficiaries requires the help and expertise of volunteers. 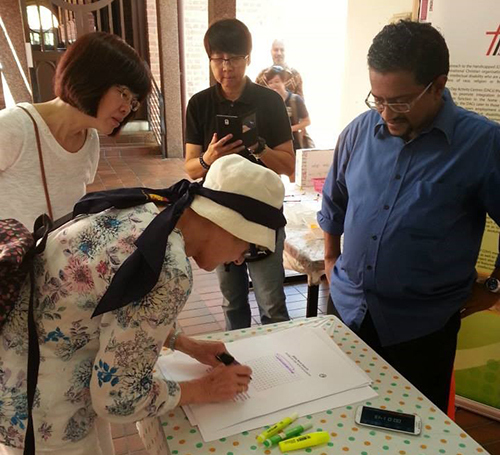 Besides having individual volunteers helping out at our centres, we also collaborate with corporations, churches, schools, the National Library Board and People’s Association. They facilitate different community events which involve our clients. This allows them to be independent and acquire the necessary social skills to help them integrate into society. Will you join us in recognising the inherent worth and potential of persons with disabilities, as cherished children of God? 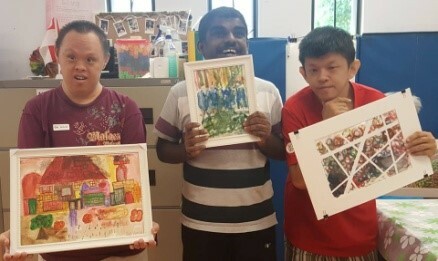 Open Mondays to Fridays, 9.30 a.m. to 2.30 p.m.
Volunteer with us – befriend and engage our clients with activities such as arts and crafts, or sports. Donate – your donation will help sustain us in our long-term work for people with special needs. Financial donations are tax-deductible at 2.5 times the amount donated. Be an advocate – connect us with potential donors or volunteers. Adopt us – adopt us as the beneficiary of your fundraising events. Upcoming event next year: COH’s Flag Day on 25 Nov 2017 (Saturday), 9 a.m. to 6 p.m. Please mark your calendar and be part of making a difference in our clients’ lives. is the Assistant Executive in Marketing and Corporate Communications for Christian Outreach to the Handicapped. 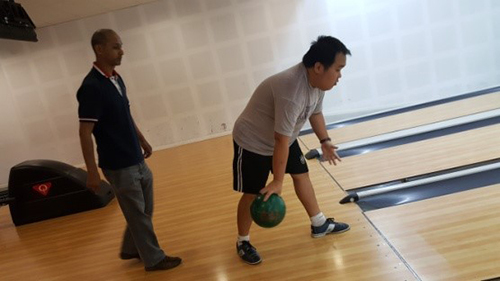 A teacher, Harjit, training his client in bowling. 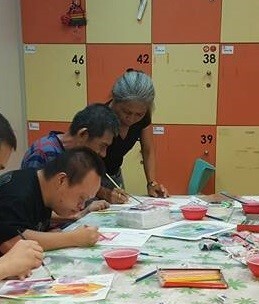 The North East Community Development Council funds drawing and water painting lessons for clients by a professional artist. Clients proudly displaying their artwork. 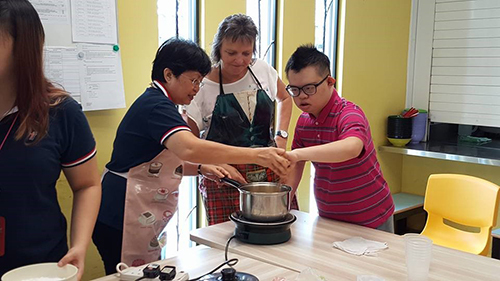 A volunteer and a teacher guiding a client with Down Syndrome in making lemon curd. COH participates yearly in St George’s Church Missions Fair. 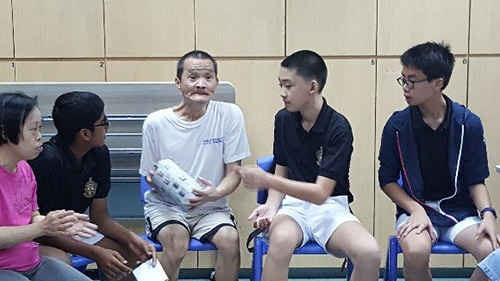 Students from Raffles Institution playing games with our clients.